Been trying out Alert Thingy and so far, it’s not bad I must say although there are a few things I like and dislike. First, the pros. I like the fact that FriendFeed has a client that runs on MacOSX, Windows, and sorta linux (Adobe Air is alpha stage for linux). The alerts are similar to Growl notification which is interesting, but also a nuisance too. 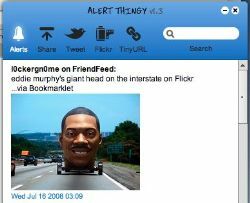 You can also interact with Flickr and Twitter, which is actually very useful in that regards. The cons? The nuisance of Growl-like notification. As far as I can tell, you can’t turn it off. And Adobe Air. While Adobe Air allows easy multiplatforming, it also is overhead that I don’t need. Either way though, it’s not too shabby and it’s nice to actually have a client for FriendFeed instead of just the website itself. I’d love a native client, but right now this will do.